This is just a quick update to tell you that the second puzzle in The Year of Puzzles is coming next week. It's a great oversize Rows Garden by Patrick Berry, who invented the puzzle type. And the story by Emily Dietrich continues. We'll send an update when it's ready, with instructions on how to sync your iOS device with your puzzazz.com account and how to download the PDF if you're solving on paper. Since only the first puzzle is free to all, you'll have to be signed in to get the puzzle. If you haven't done so already, please visit your account page (http://puzzazz.com/account) and verify that The Year of Puzzles is showing up. If it's not, please drop us an email so we can get things fixed up before the puzzle is released. We'll be releasing the monthly puzzles around the 20th-25th of each month. The six holiday puzzles will be spread throughout the year, on holidays of course. 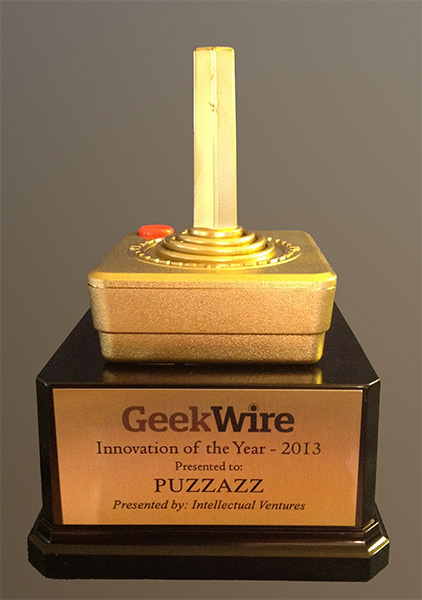 While we're at it, we won GeekWire's Innovation of the Year award for 2013 last week! It's a huge honor. Thanks to all who voted for us. The trophy is very cool. Details on our blog. Awesome trophy. Congratulations, you folks truly earned it! !